work which allows the plants alone to take over technical, ecological and aesthetic functions. Chap-ter 7, which is the largest one, contains methods of stabilizing structures by combining living with non-living materials. 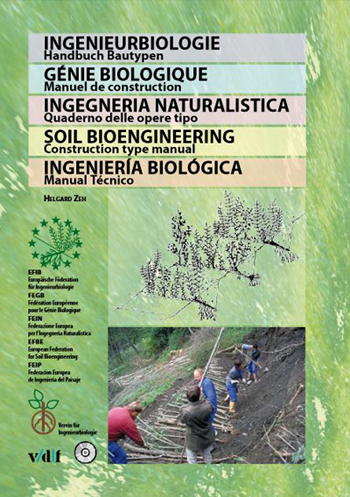 The sustainability of soil bioengineering measures is safeguarded by maintenance to which a separate chapter is dedicated. The Construction Type Manual serves to foster understanding among experts and to harmonize European norms. 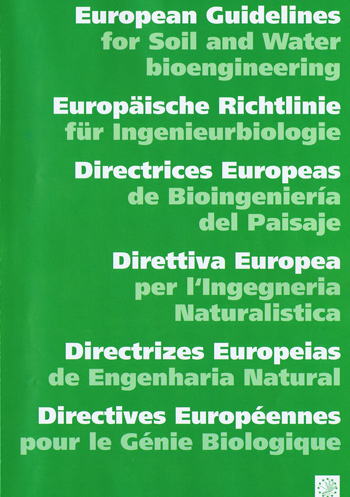 The guidelines for Soil and Water Bioengineering – put together by all the european associations for Soil and Water Bioengineering – aim at disseminate the basic principles, technical and practical approaches as well as the positive effects of Soil and Water Bioengineering. They aim at building a contribute to the upgrade and revision of different european Directives, in particular the EU Water Framework Directive, the Directive on the assessment and management of flood risks and the EU Soil Thematic Strategy. They are also aimed at being an instrument for the dissemination and standardization of Soil and Water Bioengineering. This illustrated Construction Type Manual in 5 languages: English, Russian, Portuguese, Chinese ad Korean. 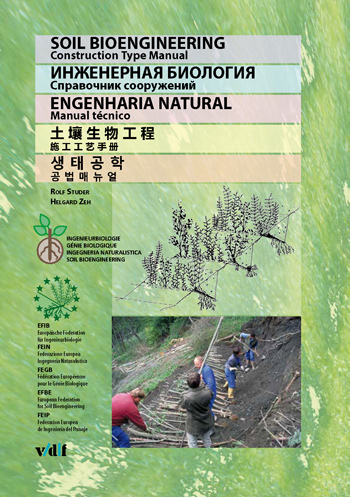 It compiles 170 construction methods describing techniques which use plants as building materials. This includes preparations necessary before they can be planted and become effective.